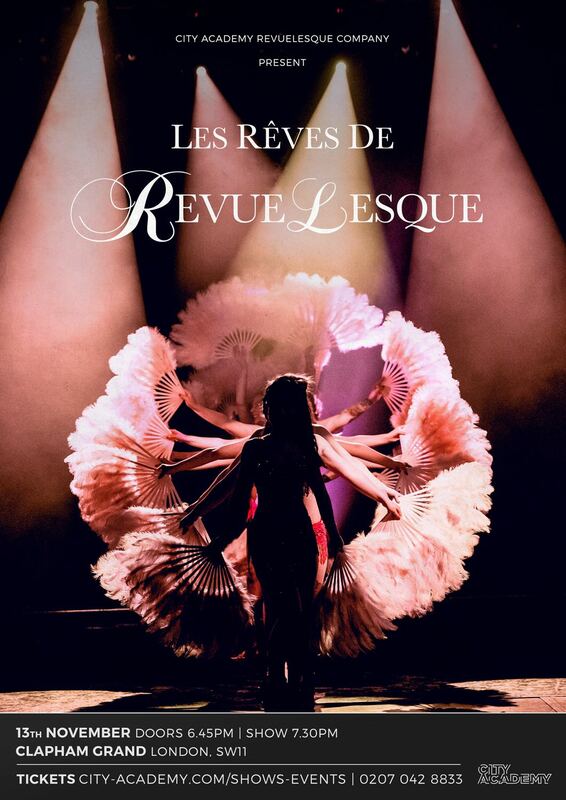 RevueLesque, City Academy’s premier burlesque company returns to Clapham Grand this November with a sizzling new show! Blending confident cabaret with charismatic can-can, the cast of 23 inspired women will take you on a tantalizing journey from traditional to modern burlesque. City Academy deliver performing arts and creative classes for adults across London. They run two burlesque companies and the women across both troupes are professional executives by day and theatrical showgirls by night! The upcoming performance will represent the premier burlesque company’s fourth showcase, having also been a huge hit at The Hippodrome in the West End! Burlesque continues to experience a real renaissance. And we’ve seen an exceptional focus on female freedom of expression this year as a result of the ‘Me Too movement.’ However, most burlesque brands on the market, particularly in London, offer run-of-the-mill acts that centre around the striptease. Which can feel conflicting to feminist progress. In this respect, The City Academy RevueLesque Company has a unique offering: a vibrant two-hour showcase, on a globally acclaimed stage, where the artists perform real burlesque dance technique, in a dazzling display with show-stopping costumes, seducing the audience – and all without shedding a cloth! The show will take place on Tuesday 13th November at 19:30 at Clapham Grand, 21-25 St John’s Hill, London SW11 1TT (https://claphamgrand.com/). Tickets to the public are priced at £19.50 but we’re offering interested journalists’ complementary tickets - or their readers, by way of a giveaway. This press release was distributed by ResponseSource Press Release Wire on behalf of We Are Tall in the following categories: Entertainment & Arts, Leisure & Hobbies, Women's Interest & Beauty, for more information visit https://pressreleasewire.responsesource.com/about.